Hey Bhagwan! Its Mother’s Day! On a warm Saturday afternoon, mum’s shop is closed for the rest of the day and my sisters, cousins and I are all squeezing for a good spot in front of the TV. It’s 1991, when TV consisted of 4 terrestrial channels and serialised programmes were on once a week. TV in the 80’s and early 90’s meant family time and if you snooze you lose; there was no option to playback a live programme. As the aroma of masala chai slithers across the room, we are under Ba’s (maternal grandmother) strict orders to keep quiet as my mum hurriedly looks for a spare video cassette in the hope of keeping her own VHS collection of the much talked about series that was about to be broadcast. The clock hits 2pm and pin drop silence pierces the living room as we await the three words that opened a new wave of Indian TV history – “Main Samay Hoon!” “I am time.” BR Chopra’s classic adaptation of Mahabharat, one of two major Sanskrit epics of ancient India, had bagged a weekly-televised slot on BBC2. During an era where Bollywood to the non-Indian’s in the UK consisted of singing, dancing and a certain Mr Bachchan, regardless of the questionable special effects and fight sequences, the grand visualisation of Hindu mythology on prime time TV injected a breath of fresh air to our parents as another means of connecting us children to our identity. As a child, having heard stories of the Bhagvad Gita, Ramayana and many other mythological tales, we watched these stories come to life on screen, and a sense of both excitement and bewilderment followed with equally inquisitive questions from fellow school friends, “A hundred sons? A never ending sari? Is that really what happens where you’re from?” At 13, I certainly didn’t know the true extent of its reality or admittedly even care, but Hindu mythology and it’s base roots continued to play a huge role in my upbringing whether it was Diwali, Navratri or Maha Shivratri. Twenty odd years later, however, as a first generation British born Indian attempting to create my own identity, I find myself asking the same questions – do these mythological characters and scriptures define who we as women are? The endless battle to eradicate injustices against the female gender within the South Asian ethnic communities has often been attributed with our inability to detach society defined “moral” code of conduct from what our religious beliefs are. The role of the Indian woman is more than often categorised before she even begins to walk; she’s not just a sister, daughter, wife and mother, she is the nurturer, the homemaker and the carer. She vows to never be superior to her husband, as did Mahabharat’s Gandhari, the wife of Dhritarashtra who was blind at birth. In order to ensure she never enjoyed the luxuries of life that her husband could not, Gandhari blindfolded herself and was hailed a sati for her sacrifice. Sita, the wife of Lord Rama in the Ramayana and daughter of earth goddess Bhumi, set the standard of the depiction of a virtuous, pure and self-sacrificing obedient wife by jumping into a fire, after she had been rescued from Ravan, to prove her chastity whilst she had remained captive. Yet, as the Ramayana theme was based on leadership, sacrificing his partner to eliminate doubts in Lord Ram’s village surrounding Sita’s character was seen as an act of a good leader. So how are these representations of Stridhrama (duties of a woman), defined in scriptures still applicable today? In a generation where women are walking shoulder-to-shoulder with their male counterparts, and many becoming the sole breadwinner of a household, surely such submissive characters are hardly role models us women should attempt to even partially mirror as they are still used to reflect the limitations of a woman’s power? Recently, my mum’s brother wrote a thought provoking small article for a local Asian newspaper, in which he rightly points out that our moral beliefs and social conduct code should not be mixed up with our perception of what we feel religion is to us. If you take four blind men to feel an object, each one will give a different description of what they felt, he says. Similarly, it can be argued that transcripts have been written by scholars based on subjective views on what makes up the foundation of Hindu religion and we as humans create our own view on what part it plays in our lives. Now in 2014, amongst the jungle of international TV channels available in the UK, a well-known Indian TV channel has re-produced the Mahabharat series, and I bring this topic up with my mum who is in complete agreement with her brother. “Of course it’s about perception and what you choose to take from the Ramayana or Mahabharat stories”, she clearly states. As we watch the much hyped new series that boasts of uber-modern special effects (but sadly minimal emotions amongst the actors! ), my mum points out how even in the Mahabharat, the ritual of Swayamvar, allowed a bride to choose her husband from a selection of suitors, and was not necessarily forced to wait until her wedding day to find out who her groom was, contrary to what modern day extremists choose to follow even in the UK. The stories of Mahabharat are certainly not short of evolving feminists. Draupadi, daughter of King Drupada, may have had no choice in marrying all five Pandava brothers, but it was she who manipulated the war against the Kauravas after she was publicly disrobed and humiliated by Duryodhan. Satyavati, wife of King Shantanu, wielded true power and took Hastinpur by storm in her attempts to continue her lineage. Kunti, daughter of Devameedha Shurasena, broke the sequence of brides being forced into marriage, and later went on to use her wisdom to educate her sons in using their power with manipulation and advise them on alliances. Where the male characters of Mahabharat may be remembered for fighting battles, it is the women who often took control and decisions to drive events within their favour. My uncle was right; it was about all about perception and what I chose to believe against what society feels should be implemented. I do choose to believe that our culture, socially and religious, does reflect some aspect of female empowerment, which is mirrored in the women surrounding me today. 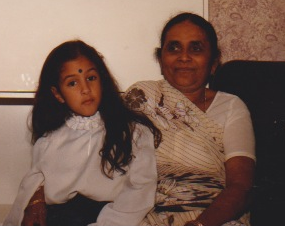 My grandmother, widowed for over 30 years, in a country foreign to her, has played the role of a mother and a father to her children and grandchildren. My mother, created an independent life from the young age of 17, and takes pride in the fact that her daughters are her sons. 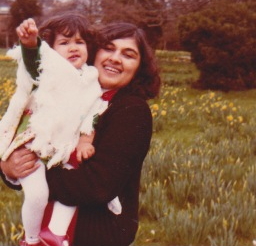 My mum’s sisters and sister-in-laws happily walked into a ready made family, before they even had their own children, and nurtured us equally as their own. Be it the Goddess Laxmi, consort of Vishnu and Goddess of wealth, who is quoted in the Bhagvad Purana stating that when she failed to find anyone to protect her, she decided she has to protect herself; or the Goddess Durga, the nurturer who is depicted with ten arms whilst killing a demon, the moral strength of these deities, are parallel in all those whose reassuring hands on our heads gave us strength to be the women we are today. Happy Mother’s Day to all the wonderful mums! !